This genus of well-known and often coveted bulbs is native to Europe from the Pyrenees in the west to Caucasus, Iran and Turkey in the East. 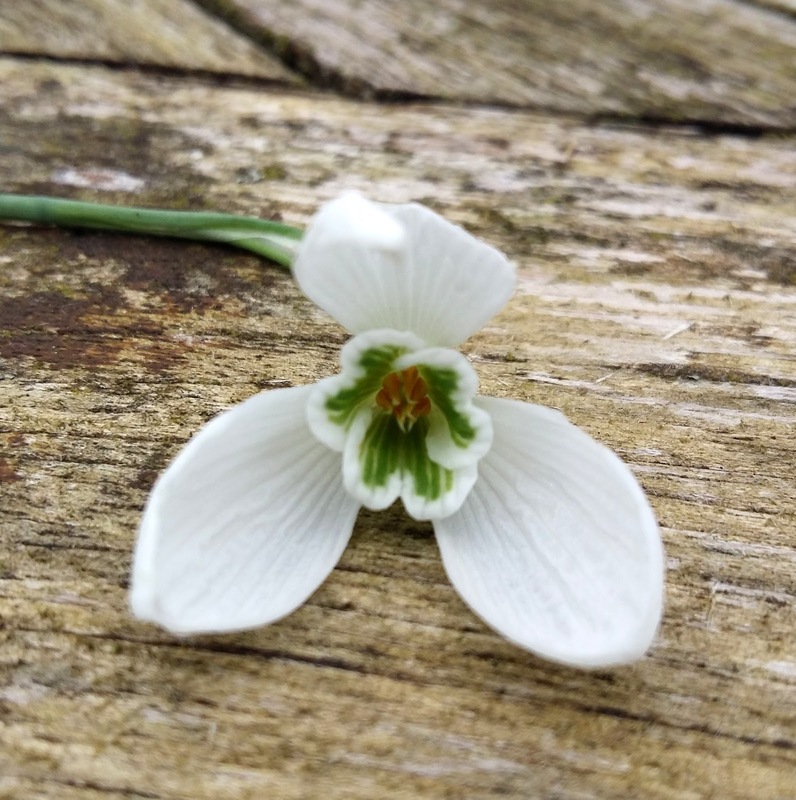 Many people think the Snowdrop is a native of Britain, or brought to the British Isles by the Romans but it is more likely they were introduced in the 16th Century. Our hearts and minds lift at the first sight of these tiny, delicate yet extremely hardy little gems. I have several cultivars dotted about the garden along with the common Snowdrop Galanthus nivalis. The species spreads itself around very well if it is happy. The cultivars take a bit longer to bulk up, apart from Galanthus nivalis 'Flore Plena' which spreads as readily as its species cousin. Plant Galanthus with other winter interest plants such as Bergenias, Hellebores, Winter Aconites, early daffodils, Crocus and evergreen ferns for a wealth of winter interest in the garden. 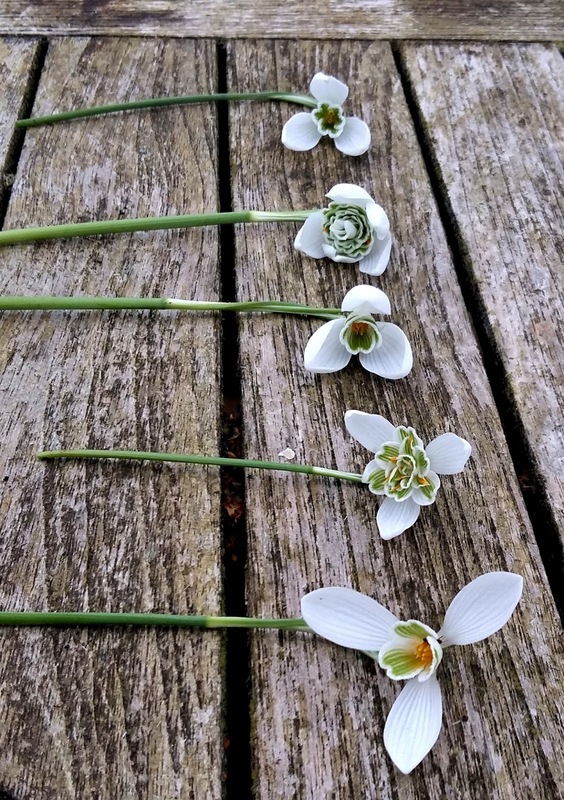 In recent years Snowdrops have become a bit of a collectable genus in the horticultural world. Their collectors have even earned their own collective name: Galanthophiles. People will pay a small fortune for one tiny bulb of rarer varieties, with some going for over £300! I once bought 3 bulbs of Galanthus 'John Grey' for £8 a bulb and thought that was excessive. There are many books on the subject and several specialist nurseries selling them. Popular and very collectable are yellow snow drops such as G. 'Wendy's Gold'. Another yellow is G. 'Lady Elphinstone', a double and so very striking. The flowers of Snowdrops are well worth looking at closely. Each flower is a drop of white with different markings and this is what makes them interesting to collectors. The nodding bell-shaped flower is held on a slender stalk amongst the leaves. The flower usually bears six tepals rather than petals arranged in two whorls of three, the outer being larger. The shorter inner tepals ate tapered and usually bear green markings at the base, occasionally the markings are yellow, green-yellow or absent depending on species. The common Snowdrop with its small white, bell flowers with a green smudge on the inner petals. Easy to naturalise. H 15cm. Snowdrop with exceptionally large, heavy, pendant flowers with a large, spreading, single green mark on the inside petals. Early-flowering. H 15cm. Fabulous fully double yellow marked flowers, very sought after. A late flowering double whereby the solid looking flower is tightly packed with inner segments that form a neat rosette. Grows well with us in clay soil. Relatively large flowered, irregular double, most strongly distinguished by the frequent appearance of a third leaf on a single shoot with occaisonal four perfect outer segments. White with green markings, the distinctive feature is the long pedicel (the spur connecting flower to stem) which allows the flower to dangle and sway with great grace in any breeze. The commonly found double with its broad flouncy green and white flowers, often found wild as commonly as its single cousin. Beautiful photos and descriptions, Rona. 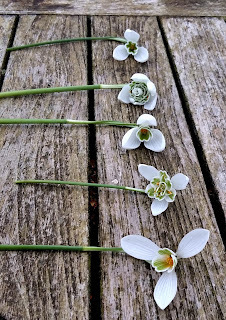 The photo with the different varieties lined up alongside each other really helps to demonstrate how unexpectedly different they are from one another, something that is hard to appreciate when newly starting out into Galanthus fan-dom. I'm not sure if you've visited Shepherd House in Inveresk before, but the owners there have a simply wonderful array of snowdrop varieties. You have to plan your visit as they are only open on certain days of the year, but it's well worth trying to go if you can. We are planning to visit Cambo for my birthday next month so I'm pleased you've given it the thumbs up! Thanks Jo, there are so many varieties now, and it's easy to get sucked in lol. I used to work in Inveresk village a very long time ago and went there before it was the garden it is now. We're also hoping to get to Cambo this year, we've visited a lot of Borders snowdrop gardens, time to head north. I hope you enjoy your birthday visit and maybe some new snowdrops as a birthday treat?